At LimoZone, we want to enhance your special events and help you build unforgettable memories. Prestigious events require a stunning vehicle to add an element of style and elegance. We have the finest selection of Chrysler stretch limo hire in Melbourne that ensures that you arrive in absolute luxury. Our Chrysler stretch limo hire in Melbourne is available for a range of events like wine tours in Melbourne, birthday parties, weddings, anniversaries and more. Choose our stretch limo hire in Melbourne to experience an enriching ride with the luxurious interiors of our Chrysler limo hire in Melbourne. Our goal is to make your trip an enjoyable and memorable one. If you choose to travel with LimoZone, you are sure to receive exceptional service that will exceed your expectations. Our Stretch Chrysler limo hire in Melbourne is much more than just a transport. It is an event and a reason to celebrate in itself. We take utmost care to ensure that you have a safe and comfortable travel experience. Our Stretch Chrysler limo hire in Melbourne is equipped with state of the art facilities to make it a memorable experience. Most vehicles include amenities like Karaoke, bar with champagne and Smartphone bluetooth connection with awesome music sound. You just need to sit and enjoy your ride while we take you to your destination. Our Stretch limousine chauffeurs are experienced, trained and reliable. They are courteous and will extend the best possible service to you. We also offer customized plans that will perfectly fit your requirement. We can cater to your specific need with our exclusive range of luxurious vehicles. 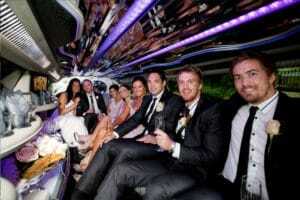 Our stunning Chrysler limo hire in Melbourne can perfectly complement your special day to make it memorable. Whether you require our Melbourne stretch limo hire service for a wedding or wine tours, we can offer you the best package. If you wish to know more about our stretch limo service, feel free to get in touch with us. We are just a phone call away from you on 0419 598 717 to book a ride. You can also contact us through our online contact form.